Happy Tuesday, everyone! We had a wonderful Rosh Hashana and made it back to New Jersey in one piece. Now I'm trying to juggle (1) a busy week at work, (2) a lot of menu planning for upcoming holidays, and (3) the "alternative Pride and Prejudice" novel I'm in the middle of. Which I'll have to tell you more about later! I'm popping in today to share a recent layout! On this one, I compared a recent photo of me and S (and Ellie) with an old wedding photo. I wrote about how much in our life has changed in the almost FIVE years since we married, and how much has stayed the same. 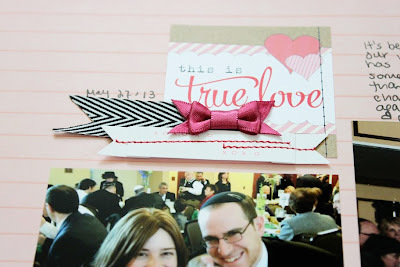 I used a lot of Elle's Studio on this layout, and some of Maggie Holmes for Crate Paper's sweet bows. Life is not always perfect or easy, but I'm so happy to have the family I have--then and now. What is on YOUR mind this Tuesday? 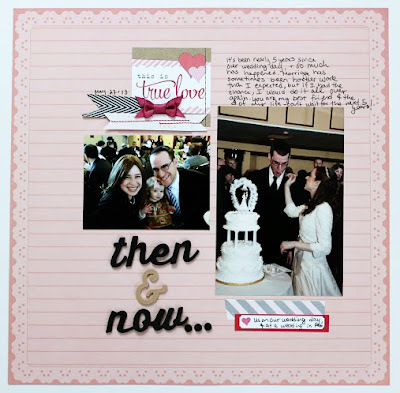 awww...adorable layout using Elle's Studio!! Your little fam is lovely!! I LOVE this layout, what a sweet memory and reflection on growth and family! I want to hear more about that "alternative" Pride and Prejudice novel!